Looking at the quarterbacks who filled up the stat sheet this past weekend with fantasy football-type numbers, several well-known names headed the list. Tom Brady with his five touchdown passes, Aaron Rodgers leading the Packers past the Bengals in overtime. But one relatively unknown name also found him name on the list. 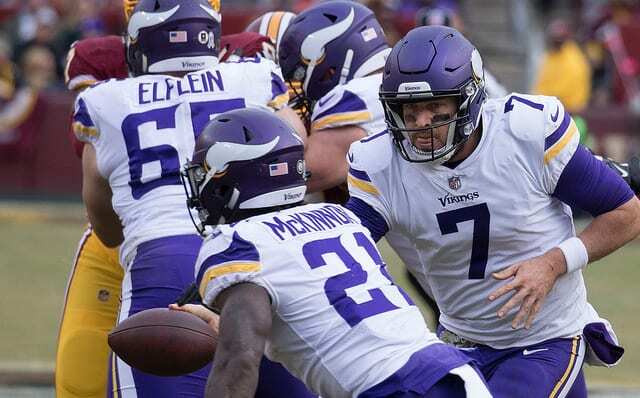 Minnesota Vikings quarterback Case Keenum had the best game of his career, going 25-for-33 with 369 yards and three touchdowns, leading the Vikings to a 34-17 home win over the Tampa Bay Buccaneers. 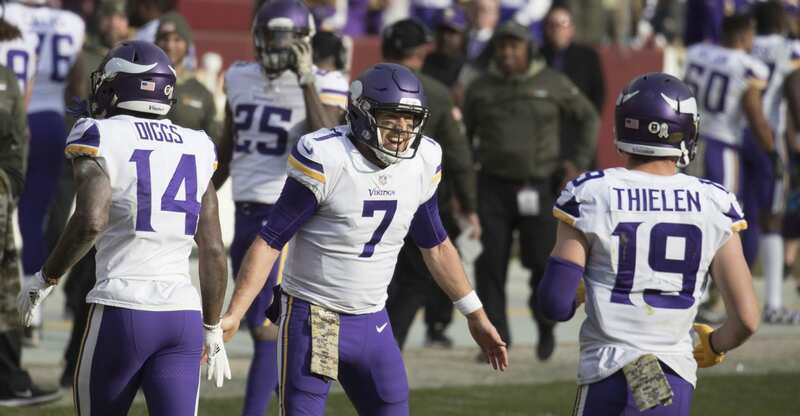 Keenum’s day was so good that head coach Mike Zimmer went outside the norm and presented his quarterback, who’s filling in for Sam Bradford, with the game ball. “I don’t usually do this, but Case Keenum,” Zimmer said on the Vikings’ website. As Keenum caught the ball, his teammates mobbed him and cheers rang through the Vikings’ locker room. The journey to the jovial locker room for Keenum has been filled with detours and potholes. In his fifth NFL season, Keenum’s career almost never got out of neutral as he tore his right ACL during his senior season at the University of Houston. The recovery from the setback was difficult, but the injury taught Keenum to lean on something greater than the game of football. “That was as tough a time as I’ve ever gone through,” Keenum told the Pioneer Press. “You just realize that football is fickle; it’s not going to be there all the time. Just getting my priorities straight and knowing the true reason I play the game, and that’s to give glory to God. That’s something I take pride in. It’s why I do what I do. As the 2012 NFL Draft came and went, Keenum’s name went unheard, despite breaking 17 NCAA passing records, including the marks for career passing yards (19,217) and touchdown passes (155). Luckily the Houston Texans came calling and offered Keenum a spot on the practice squad as an undrafted free agent. The next year, Keenum saw his first game action against the Kansas City Chiefs. Despite passing for 271 yards and adding a touchdown at the hostile environment of Arrowhead Stadium, the Texans lost 17-16. Keenum would go on to lose the next seven starts. His first win as a starter would come the next season in a 25-13 win over the Baltimore Ravens. After the year, Keenum signed with the St. Louis Rams and followed the team to Los Angeles the next season. In April of this year, Keenum was on the move yet again, which brings us back to the Twin Cities. The Vikings signed him to a one-year $2 million dollar deal as an insurance plan for Bradford the starter (and a holdover until Teddy Bridgewater is healthy). Once Bradford went down with an injury after Week 1, Keenum was inserted into the starting role. The first game on the road against the Pittsburgh Steelers didn’t go as planned, as the Vikings lost 26-9 while Keenum threw for only 167 yards. But the next start went much better against Tampa Bay, leaving the Vikings all smiles in the locker room afterwards. It’s just another chapter on the winding road and his father, Steve Keenum, has taken notice. “He’s a good man that loves his Lord and loves his wife, loves kids and he loves to play football,” Steve Keenum told the Pioneer Press. The 2-1 Vikings host the Detroit Lions on Oct. 1.